Dubai: There was no change at the top of ICC Test rankings for teams and bowlers as India and its premier off-spinner Ravichandran Ashwin held on to their numero uno spots respectively. 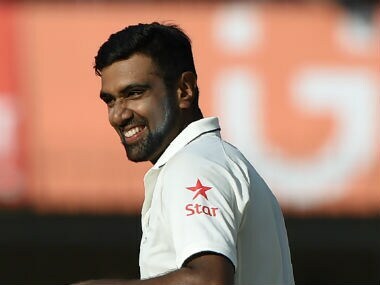 Ashwin, who became the second fastest to 200 wickets during the Test series against New Zealand, maintained his position with 900 points, with South African pace spearhead Dale Steyn (878) and England's James Anderson (853) completing the top three. Ashwin's spin partner Ravindra Jadeja was at seventh place with 805 points. Going through a purple patch, Ashwin was also leading the all-rounders' table with 451 points, with Jadeja occupying the fifth position with 292 points. Bangladesh teenage spin sensation Mehedi Hasan has rocketed into 33rd position in the MRF Tyres rankings for Test bowlers after bowling Bangladesh to their first-ever victory over England which earned the home side a 1-1 series draw in Mirpur on Sunday. Mehedi, who won the player of the ICC U-19 Cricket World Cup 2016 award at the same venue eight months ago, returned with match figures of 12 for 159, which has given him a lift of 28 positions. The off-spinner had entered the player rankings last week after taking seven for 138 on his debut in Chittagong. Other bowlers to improve their rankings following the Mirpur Test are England's trio of Chris Woakes, Ben Stokes and Moeen Ali. In what turned out to be a difficult Test for batsmen, England captain Alastair Cook has climbed one place to 11th following scores of 14 and 59, Bangladesh opener Tamim Iqbal has risen four places to 20th after scores of 104 and 40, Mominul Haque has lifted one place to 26th after contributing 66 and one, Shakib Al Hasan is now in 27th position after moving up one place following scores of 10 and 41, and Imrul Kayes has earned two spots and is now in 53rd position after chipping in with one and 78. England's Joe Root has dropped out of the top three. He has slipped two places to fifth following scores of 56 and one. In contrast, fourth-ranked England have dropped to 105 points after conceding three points. Australia captain Steve Smith will start the series against South Africa as the number-one ranked batsman, leading South Africa's third-ranked batsman Hashim Amla by 59 points. Adam Voges (seventh), David Warner (ninth), Faf de Plessis (25th), Dean Elgar (28th) and Quinton de Kock (30th) are the other batsmen inside the top 30 to feature in the series. Amongst the bowlers, second-ranked Dale Steyn trails Ashwin by 22 points, while Mitchell Starc is Australia's highest-ranked bowler in eighth position – 69 points ahead of South Africa's 10th-ranked Vernon Philander.